If you’re looking for a proper homemade meal that is simple and quick to prepare - but looks as though you have been planning and preparing in the kitchen for ages - this one is a definite contender! It is a useful idea for using up cold meat and ‘stray’ vegetables from the fridge (remember that one lonely pepper left lurking from the night before lasts’ dinner)? As with most recipes, this one can be adapted to suit your taste and what you have in the fridge. The following serving suggestion uses chicken and apple; but pork or turkey and apple (or pear) and lamb with dried apricots are just as tasty and simple. Why not try them all; or invent your own version? Other alternative ingredients include substituting the mushrooms with fresh peppers or celery. If you are out of fresh vegetables, the addition of some frozen sweetcorn or peas make useful alternatives and go well with just about any of the combinations mentioned! Melt the butter in a heavy-based frying pan or skillet and fry the onion over moderate heat until translucent. Add the sliced apple and curry powder. Stir well and cook gently for 5 minutes. Sieve in the flour and mix well then, gradually stir in the stock and simmer until thick and smooth. Next, add the cooked meat and mushrooms. Season the mixture to suit your taste with a little salt and pepper then, add the tomato puree and herbs. Stir well and cook the combined ingredients for another 5 minutes then transfer to your pie dish. On a lightly floured surface, roll out the pastry (follow packet instructions for defrosting if using frozen pastry) so that it is just a little larger than the top of the pie dish you intend to use. 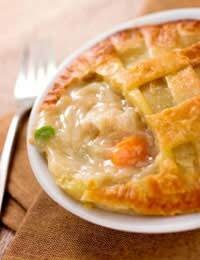 Carefully place the rolled pastry over the pie dish and then cut it to fit the dish.Use the pastry scraps to make some decorative leaves and place them wherever you fancy on top of the pie.Use the beaten egg to glaze the pastry and sprinkle a little sea salt over the top. Use a sharp knife to make a small incision in the centre of the pastry. Bake your pie in the preheated oven for approximately 30 minutes, or until the pastry is cooked and a tempting golden brown in colour. Serve straight from the dish or leave to cool. This dish is great with mashed potato and fresh seasonal greens; or it can be served cold with a crisp green salad and French bread.